Posted on October 13, 2018 at 10:44 am. It’s not an exaggeration to say that artists have featured animals in their work since…well, forever. Think of cave paintings, some of the oldest pieces we have on record, and you won’t fail to conjure up images of deer, birds, and more pursued by human hunters. The impetus to engage with and portray animals creatively is an age-old artistic phenomenon, something the Denver Art Museum picked up on when putting together their current exhibition, Stampede: Animals in Art. 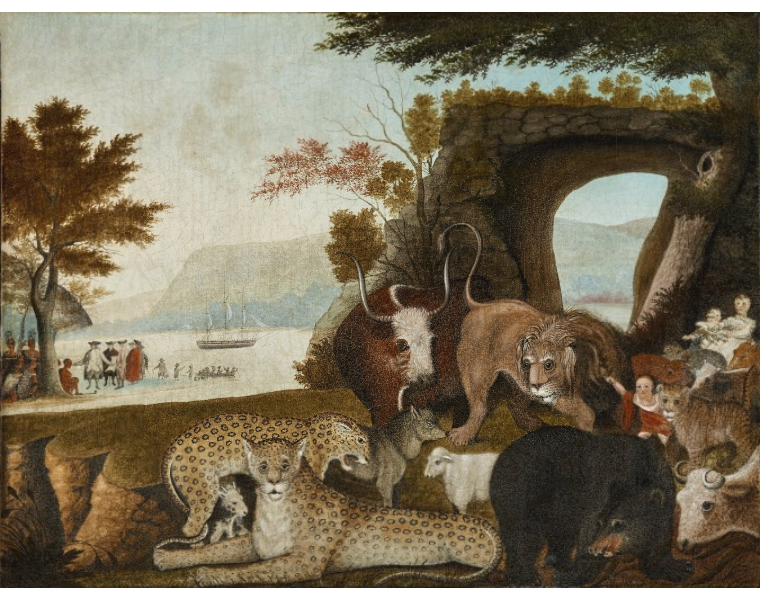 Edward Hicks, The Peaceable Kingdom, 1847, included in the Denver Art Museum’s Stampede exhibit. Image c/o the Denver Art Museum. Included in the exhibition are favorites from the museum collection, such as the Four-faced Hamat’sa Mask by carver George Walkus of the Kwakwaka’wakw people of Vancouver Island (Canada), Georgia O’Keeffe’s 1921 oil painting Cow Licking, a northern Thailand artist’s Guardian Lion, Mexican Baroque artist Juan Correa’s Allegory of the Holy Sacrament, and Enrique Martínez Celaya’s 2009 Portrait of Vicki and Kent Logan, to name just a few. Even in these few pieces, it’s easy to see just how different artists use animals in their work for different ends. 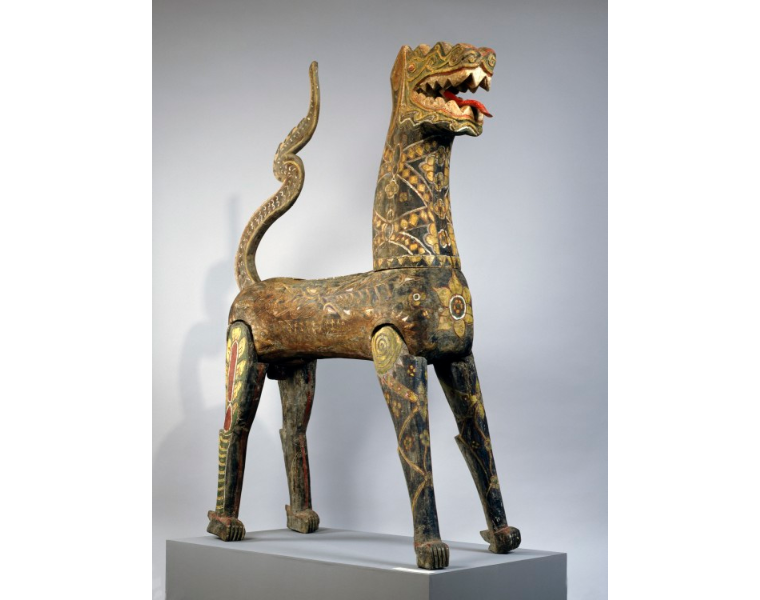 An unknown Thai artist’s Guardian Lion, c. 17th-19th century. Image c/o the Denver Art Museum. Touching on the universality of featuring animals in art, the museum offers a variety of tie-ins that encourage visitors to engage with the exhibit. As evidenced by many museums’ new strategies, interactive elements are a great way to help make any exhibition more accessible and a fun experience for all ages. For Stampede, photos are encouraged (Xiaohang Wu’s Blue Fish being a popular backdrop for the Instagram-inclined visitors), and visitors can try their hand at drawing in the galleries. According to their website, the museum has also set up “an interactive space where visitors can learn about the creative process behind the Never Alone video game created by Native North Alaskan storytellers,” as well as a 3-D studio for “hands-on artmaking activities related to animals” for all ages. 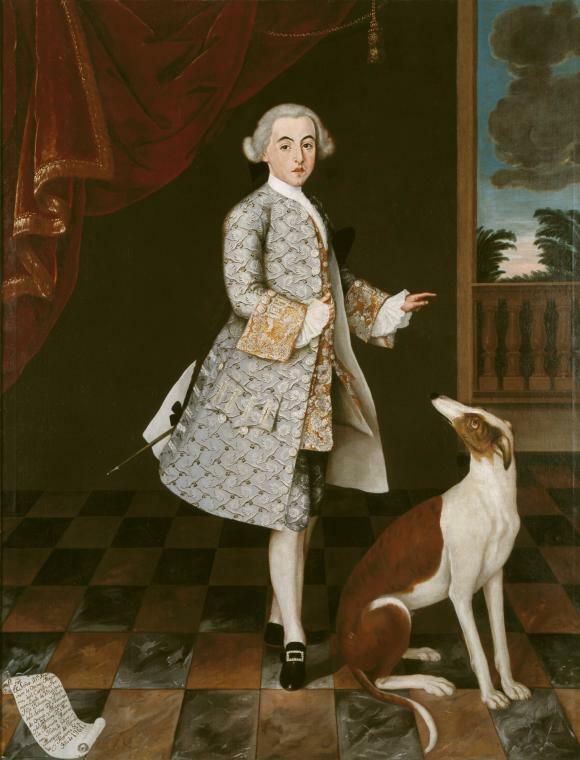 An anonymous Mexican artist’s Portrait of Don Francisco de Orense y Moctezuma, Conde de Villalobos, 1761. Image c/o the Denver Art Museum. So if you’ll be in the Denver area in the next six months or so, we’d recommend stopping in to take in Stampede and exlporing the many ways artists portray and interact with animals in their work. It’s a great topic for all ages, so don’t hesitate to bring the kids…especially since general admission at the Denver Art Museum is free for kids! Read more about Stampede and the Denver Art Museum here! Discover more about what we do at the Art Docent Program here, and follow us on Facebook for more fun updates! Check out our blog archives for more stories on art, art history, and museums!